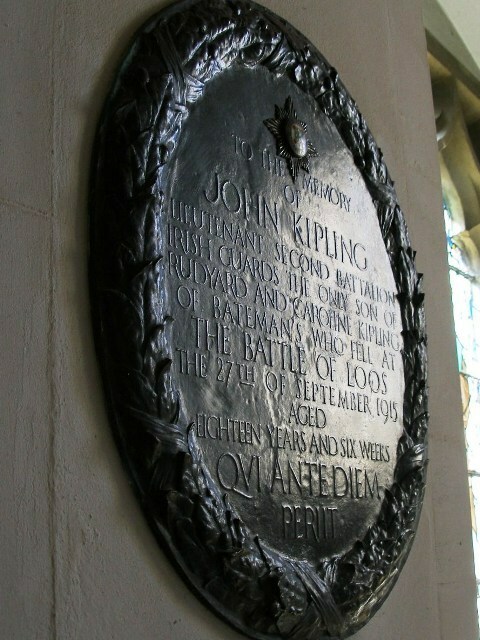 John Kipling was Rudyard’s only son, not quite his “best beloved” as that position was always held by his daughter Josephine who had died of pneumonia in 1899 when she was only 6. In fact, John emerges from his father’s biographies as someone who had “not turned out altogether well” (Martin Seymour-Smith), was backward in his school work (Charles Carrington) and caused his father anxiety (Lord Birkenhead). Certainly the letters Kipling sent to John at school are full of pleas for him to work harder, steer clear of ‘beastliness’, lose gracefully, and not be so carping and critical. There is a gap in the letters from October 1913 to September 1914, a crucial period in John’s life when he was removed from school, Wellington, and sent to an army crammers. When war broke out in August John was still only 16. Nevertheless he wanted to join up and made several unsuccessful attempts to do so but was always refused on the grounds of short sightedness. Eventually his father pulled strings and John received a commission in the Irish Guards. However, to some there’s been a suspicion that the one life Rudyard was prepared to give was his son’s rather than his own. It’s something of a surprise therefore to come across a photograph of a mature, prepossessing young man in uniform and to realise that this is John. And to see from the letters that far from being a disappointment to his father, Rudyard is undisguisedly proud of his officer son, proud that John is a volunteer, that he is so young, and that he is coping so well. One can sense Rudyard’s keen pleasure when, following John’s first home visit, he described to his daughter Elsie how, “We talked and we talked and we talked – this grown up man of the world and I.” But the pleasure was tinged with fear. Rider Haggard, a good friend of the Kiplings, saw them on 24 March 1915 and recorded in his diary that neither of them had looked well. It is only once John is in the army that any letters from him appear in the Kipling Archive at the University of Sussex. This is the first time we hear his own voice and it immediately dispels any fears that he might have been an unwilling victim of his father’s military enthusiasm. Although John’s handwriting is immature and his spelling uncertain, he comes across as confident, energetic and full of initiative, an opinion which the army must have shared to judge by the responsibility it gave him. I wish I didn’t miss you so much as I do , old man. You were a huge nuisance at times but I seem to have got fond of you in some incomprehensible way. The countdown to battle had begun and John knew it. In a letter home on 10 September he had written, “Dad most likely knows what is going to happen out here in ten days’. Believing that this offensive was at last going to result in a break through and end the war, the Irish Guards went into action on 27 September. John went missing that same day. It was his first engagement. The news reached Bateman’s, the Kipling’s home in Sussex, on 2 October. One source says that it was brought by Andrew Bonar-Law, Conservative Colonial Secretary in Asquith’s Coalition Government. Kipling met him with the words, “You have come to tell me my son is dead”. When I arrived, he said ‘What have you come down for?’ I said ‘To see what I can do’. ‘You can do nothing’ he said but I saw a quiver in his lips which showed how the thing had gone home. And when someone offered them a bull dog puppy, hoping it would bring them comfort, they thought about it and refused, the memories it conjured were too painful. Kipling met Rider Haggard in London on 22 December. Haunted by his friends’ sorrow, Haggard made every effort to find out what he could. Eventually he discovered a guardsman, Bowe, who visited Haggard and related how he had seen John Kipling blown to pieces by a shell. Haggard felt pleased to be able to send his friend a signed statement from Bowe to this effect. But later the soldier who had accompanied Bowe wrote to Haggard to say that Bowe had not told the truth. What Bowe had told this soldier was that he had seen Mr Kipling heading back to the rear, trying to fasten a field dressing round his mouth, which had been badly shattered by a piece of shell. Bowe would have helped him but the officer was crying and Bowe didn’t want to humiliate him. Haggard did not pass this information on to the Kiplings. Many of the bereaved took solace in Spiritualism and Carrie, Rudyard’s wife, was tempted to try this for herself since she was desperate to make contact with John. But Spiritualism was something that Rudyard vehemently spurned despite, or maybe because, of his sister Trixie’s belief in it. Yet when Rudyard was asked if he thought there was anything in Spiritualism he said he knew for certain that there was. It was the money the mediums made from the gullible bereaved that most offended him, together with the revolting way they conveyed their communications with the dead – twitching, stiffening, slavering and groaning. But Kipling understood what drove the bereaved and perhaps there is some truth in the newspaper stories that the Kiplings did consult mediums, not so they could make contact with John but so that they could locate his body. They never did. Of the officers, 2nd Lieutenant Pakenham Law had died of wounds; 2nd Lieutenants Clifford and Kipling were missing …It was a fair average for the day of a debut, and taught them something for their future guidance. At this point many commentators have expostulated at Kipling’s callous indifference. What they don’t do is quote the following sentences. Their Commanding Officer told them so at Adjutant’s Parade … but it does not seem to have occurred to any one to suggest that direct Infantry attacks, after ninety-minute bombardments, on work begotten out of a generation of thought and prevision, scientifically built up by immense labour and applied science, and developed against all contingencies through nine months, are not likely to find a fortunate issue. In 1917 Kipling was appointed to the Imperial War Graves Commission as its literary advisor. Every word the Commission used was written, chosen or approved by him, including the dignified inscription on the headstone of the unidentified dead, ‘A soldier of the Great War. Known unto God’. This could be adapted to incorporate any scrap of information that could be discovered about the dead man: a Canadian soldier, a German soldier, a Corporal of the Black Watch, a Lieutenant in the Irish Guards. Kipling, who had done his work for the War Graves Commission so well, and who had expressed the grief of the whole nation with great dignity and without rancour or bitterness or triumphalism, could not be quite so dispassionate for his own son. Note John’s age, 18 years and 6 weeks. The precision is a covert criticism of all those, namely the Liberals and Socialists, whose complacency in the face of German militarism had left Britain ill prepared for war in 1914. And who, even after war was declared, dragged their heels over conscription so that in the early years the army had to depend on volunteers and some of them, like John, were only boys. And in another departure from his Commission work, Kipling, who had spoken so plainly for the nation, quoted in Latin for his son. ‘Qui ante diem periit’, who died before his time. The quote comes from Henry Newbolt’s poem, Clifton Chapel. A father, introducing his son to his old school chapel, points out the plaques on the wall of old boys who have been killed in the service of their country. He died far away, and before his time, but as a soldier and for his country. This is exactly what John did. There is a postscript to the story. In 1919 a body was brought in from the old Loos battlefield. 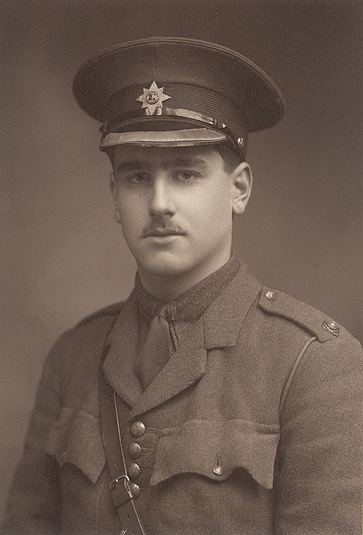 Unrecognisable and with no identification disc, all that could be told about him was that he had been a lieutenant in the Irish Guards. The body was buried in St Mary’s Advanced Dressing Station Cemetery under a headstone which read, ‘A Lieutenant of the Irish Guards. 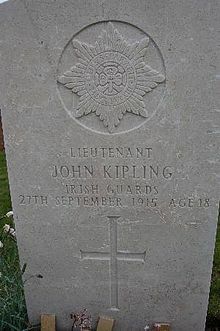 Known unto God.’ In 1991, research by a War Graves Commission officer concluded that on balance this lieutenant had to be John Kipling. Consequently the Commission altered the headstone to reflect the new identity. The identification has been fiercely challenged by authors Tonie and Valmai Holt in their book My Boy Jack. In the face of this challenge perhaps the best inscription remains, ‘Known unto God’. Thank you for your comments and for your information that it was Sir Charles Wheeler who designed and made John Kipling’s memorial for Burwash Church. I’m pretty sure I got my information about Baker designing the memorial from the DAC Sussex; it was on the application form – of course I can’t find the reference now! Baker was one of Wheeler’s early career patrons so maybe there was some connection between the two over the memorial. Nevertheless I shall change the reference in my article and am grateful to you for pointing it out. Thank you!